Subscribe to the Church Crookham Garden Society RSS News service. Receive notification when new items are published. Click here… and save to your Email reader or bookmarks. Church Crookham Garden Society was formed in 1954 as the Ryelaw Garden Society. It was founded by residents of Ryelaw Road as an outlet for their interest in gardening. At some time in its early stages, the Society began marketing garden supplies and until 1997 traded from sheds located in Moore Close. The name of the Society was changed to Church Crookham Garden Society to reflect the wider residential location of its members. Shows were organised and now two shows per year are held, one in the spring and one in late summer. In 1997 the ground occupied by the Society’s sheds was subject to planning consent for residential building and the Society moved to a purpose built concrete structure located in the car park of the Crookham Memorial Hall in Sandy Lane, Church Crookham. Each committee is made up of elected members, and is chaired by the Society Chairman. As a Not for Profit Society these are deliberately kept low to encourage membership and participation and are currently: individual £3.00 or £5.00 per couple. Do please enrol early in the season at the sales shed and collect your new 2019 membership card, as your receipted membership card must be shown before purchases can be made. Do we have your Email address? Please check we have it right when renewing membership. The sales shed, located in the car park of the Crookham Memorial Hall, is open on Saturday mornings, at 10:00 to 11:30h between February and September. It is for members only but new members can join at the shed. 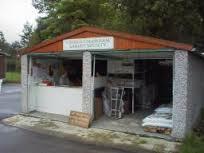 The range of goods available is extensive, from composts and fertilizers to twine and canes. Most of the goods on offer are at prices that are considerably cheaper than garden centres and DIY shops. The sales shed is manned by volunteer members. It is a condition of membership that members help out at the shed when required. We currently have 13 teams of helpers who do three Saturdays per year. In addition we have a small pool of reserve helpers who stand in for team members to cover holidays or other times when they are unavailable. We are always on the look out for additional helpers. Other products that are available include pesticides and herbicides, lawn-care products, ant and slug killers, plant pots and trays, grit and vermiculite. Due to very limited shelf life, seeds and bulbs are not stocked. Garden tools are not stocked due to low turnover. A complete list of items available from the sales shed can be found in the “Trading” section. On a Saturday towards the end of May, the Society runs a plant sale. Members who have spare plants, such as bedding or pot plants, offer them for sale and donate 10% of the takings to the Society. This sale is at the same time as the shed opening, and usually provides one of the busier Saturdays of the year.